The Double-0 Section 1995 - TODAY! "Goldeneye" (1995) arrived after a six year wait with a new Bond- Pierce Brosnan, and a new composer- Eric Serra. While an interesting score, fans weren't thrilled and apparently neither were the producers who had Serra's arranger and orchestrator, John Altman, rescore the entire tank chase sequence. Serra's version is on the CD (I swear I hear the Chipmunks in there) and a cover version of Altman's is included on "Bond back in Action-Vol. 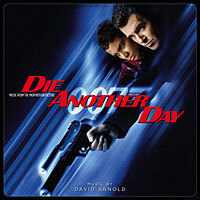 2"
"Tomorrow Never Dies" (1997) introduced composer David Arnold to the series who combined a little of the old John Barry sound with his own newer, boom, crash, action music. We also got TWO CDs of music this time! (Only half of the score had been completed in time for the first album and Chapter III records put out a CD with the rest). 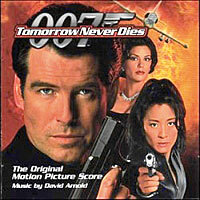 Unfortunately, one of the best Bond themes in a long time, "Surrender", performed by K. D. Lang was pushed back to the end titles in favor of Sheryl Crow's so-so "Tomorrow Never Dies". There is however, a great collaboration with the Propellerheads on the "Company Car" track as well as Moby's take on the James Bond Theme during the closing credits. "The World Is Not Enough" (1999) brought Mr. Arnold back with a nice title song performed by the band Garbage. Another good action score, a little more on the techno side, with a lot of the Bond theme thrown in. If the music on the score CD left the listener wishing for something more, they got it in 2018 when La-La Land Records released a 2CD set including all sorts of unreleased tracks, alternate versions, and even demos by the composer. Great stuff! "Die Another Day" (2002) gave us another nice score by Arnold, but also a shoddy CD release that didn't do it justice. Again, the La-La Land label re-released it in a beautiful, expanded, and remastered 2-CD set with over an hour of never-before-released music! There has been a lot of unauthorized music from this movie floating around, but this is the first authorized release which includes music that I don't think was available in the bootleg versions. It will NOT however, include the Madonna theme song or Paul Oakenfold's bond theme or all the interactive computer nonsense from the original release. If that means anything to you, you may want to keep the original stashed somewhere. "Casino Royale" (2006), "reboots" the Bond series and introduces Daniel Craig to the role. The familiar James Bond theme doesn't show up till the end credits. Snippets of it are scattered throughout, but one misses the guitar riffs and blaring trumpets. They did jam 75 minutes of music onto this one (and 13 extra tracks on the i-Tunes site). The title song, "You Know My Name" by David Arnold and Chris Cornell is not on the CD. Of the several versions available, the one in the film is only available... in the film! "Quantum Of Solace" (2008) Mr. Arnold has taken some flak in the past for over-using the Bond theme, but like Casino Royale it is only heard in the end credits while tiny bits and pieces wind through the film's atmospheric, location oriented music. The title song, "Another Way To Die" by Jack White and singer Alicia Keys is included. The version during the credits was better than the single, but you'll probably never listen to it again anyway. Track down the instrumental instead. 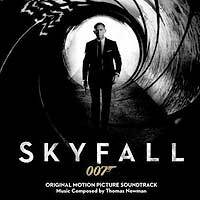 "SKYFALL" (2012) brought in Thomas Newman to take over the scoring duties. While David Arnold's music was often a listening experience in itself, Newman's is more of an accompaniment to the film. We get a little more of the familiar Bond theme in this one as well as a lot of repetitive action music which takes away from some of the good stuff (try "The Chimera"). 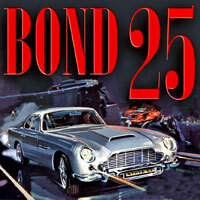 The theme sung by Adele is not on the soundtrack CD, but can be found on a CD single and is a real Bond theme! Look for the import version which has both the vocal and instrumental (which is like a Bond score all by itself!) You can also find one extra track (Old dog, New Tricks) on iTunes. 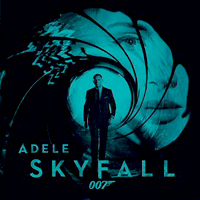 There was a 3 CD version of the Skyfall soundtrack sent out to members of the Director's Guild for the Academy Awards. One CD with the theme and 2 CDs with 34 tracks from the score if you're lucky enough to come across it. "SPECTRE" (2015) brought back Newman and seemingly a lot of music recycled from Skyfall. There is some good stuff (try "Los Muertos Vivos Estan") mixed with a lot of repetitive action music. The theme song, "Writing's On the Wall" by Sam Smith is not on the score CD. It is available as a single that also includes the instrumenal, but unfortunately his voice bleeds through here and there. A shorter version of the instrumental is included on the CD with no voice and may be more to your liking. No extra tracks on iTunes this time. Oh, and Radiohead apparently did a song for SPECTRE that didn't make the cut. They have released it for fans on "Soundcloud"
DEADLIER THAN THE MALE / FOREIGN INTRIGUE / KEEP ME COVERED / SINGLES / WHAT'S NEW?